There's no way around it: every pool should have a cover. Some pool owners get by without one, but I can assure you they're spending way more time and money opening, winterizing and maintaining them than people with covers. So, yeah: it's definitely a good idea to invest in a high-quality cover that will last you years to come! There are several reasons why pool covers are a great idea, but among the best is that it will make your life a whole lot easier! Some swimming pool covers are designed specifically to serve as safety barriers for people or animals who happen to fall in, and are usually made of sturdy mesh and each one has its own weight limits; the higher the weight limit, usually the heavier the cover. These mesh covers are usually installed with a roller of some type to roll them up either manually or electronically. About 70% of energy is lost through evaporation and pool covers minimize evaporation. How? How quickly the water evaporates depends on some other factors, too, like wind, temperatures, and humidity but the average pool loses about 25,000 - 50,000 gallons of water per year this way. That means you'll have to add more water to keep your pool full, which means your pool heater will have to work harder and longer to heat up the fresh water. Pool covers also keep heat in the pool and serve to kind of keep your water warming even after you turn the heater off. And solar covers go a step further by collecting the heat of the sun and directing it into the water to warm it naturally. All these factors help save energy by heating your pool naturally and preventing you from having to add as much new water each week. The most common pool chemical you probably use is chlorine. The problem with chlorine is that it deteriorates under UV rays. A pool cover will obviously help protect the water from the sun when the pool is not in use, cutting down on the amount of chlorine you need to add each week. This may be a no-brainer, but keeping your pool covered keeps out unwanted debris. A lot of pool owners don’t think much of this because they simply skim leaves and bugs out of their pools every morning. But what about the things you can’t see that cling to the bottom and sides of the pool surface like algae spores and dirt? Keeping a cover on it helps cut back on these unhealthy pool invaders. This also means less scrubbing and vacuuming for you. Now that you understand why a pool cover is so important, let’s go over the different types. Let's check out the pros and cons of each one. Sun2Solar solar blankets are made from a film of thousands of tiny bubbles, which work together to collect and retain heat both at night and on those chilly days. If you're interested in heating your pool efficiently and cheaply, then a solar pool cover (aka bubble cover) is the way to go. Gives you a longer swim season,thanks to that warm water! Safety pool covers—sometimes called security covers —are what the majority of pool owners use, and they’re designed specifically to prevent drowning in the event a child or pet wanders into the pool when no one is around. They're strongly constructed and usually have some type of anchor system around the edges of the pool to keep it in place and will hold more weight than other covers. Standard winter covers—also called tarp covers—are the most basic types of pool covers and are just what they sound like——tarps made out of polyethylene material. As the name suggests, many pool owners use these when they’re shutting down their pools for winter season. Automatic pool covers are usually made out of a vinyl material and tend to be on the expensive side, but some pool owners like them because of their “set it and forget it” features. Swimming pool covers are important, but just like anything else involving a pool, there are some precautions you should take to ensure everyone’s safety. ​Never mistake a solar cover or tarp for a safety cover. These covers are not meant to hold much weight and they will fold with very little. ​Take other measures to keep small children out of the pool area if you are using a tarp or solar cover. ​Use a pool cover pump to keep rainfall from weighing down your cover and causing it to sag or tear. ​Never allow children to intentionally walk on a pool cover, even one that is meant for safety. Make every effort to keep your pool area enclosed. Check your pool covers often for loose stitching, tearing or wear. Replace them when necessary. Read manufacturer instructions carefully as safety covers have specific installation requirements in order to work correctly. Also, some warranties are voided if your pool doesn’t meet certain specifications. There are lots of extra accessories you may want to consider for your pool cover. If you have a pool cover made from a solid material, water from rainfall will collect on top of it, causing it to sag, tear and become too heavy to remove. A pool cover pump is a device used to pump water the water off the cover to prevent this. They come in either manual or automatic models that you either turn on when in use or that kick on when they detect water. Reels are used mainly with solar covers. 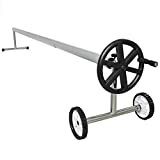 They are metal gadgets that you install at one end of your pool to roll your cover up with, and usually come with handles so that you can easily roll or unroll the cover. 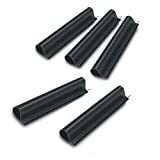 Pool cover clips are used primarily with above ground pools. They're clips that work a lot like clothespins to simply clip the cover in place around the perimeter of the pool. 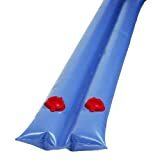 Pool cover tubes are also sometimes called water tubes or water bags. They're made to attach to the edges of the pool cover and hold them in place by being set around the outside of the pool. They're heavy when filled with water to stay in place. A lot of pool covers come with their own anchor hardware. They're more reliable than water tubes because they are actually drilled right into the deck; the pool cover ropes are then hooked to the anchor to keep the cover in place. Most anchors are designed to be pushed down into their settings when not in use. 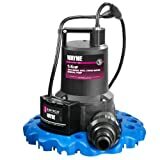 These Blue Wave covers (click here to check the price on Amazon) come with drill and tamp brass anchors, which are installed securely into the concrete surrounding the pool and the cover straps hook onto the anchors to hold it into place. It's durably sewn with reinforced stitching to prevent tearing and unraveling, and the mesh panels allow rainfall through to keep it from being weighed down by large amounts of water, but it's finely woven enough that it still keeps out leaves and debris. The stainless steel anchors resist rusting and should last many years no matter the elements they are in. These get my top pick because they will hold up to 4,000 lbs., yet they are light enough to handle alone. This mesh safety cover from Water Warden (click here to check the price on Amazon) comes with brass anchors, hooks, springs, and its own installation tools. The great thing about this cover is that the anchors are designed to recess into the cement so that they aren’t sticking up in the way of people walking around the pool. The mesh material is finely woven so that it lets water sink through but effectively keeps out bugs and leaves. It’s also very lightweight and easy to handle and store all by yourself, and has 2-ply reinforced strap webbing so that it will hold up to even heavy adults. This cover will also shield the pool from UV rays so it helps reduce evaporation and chlorine consumption. This rectangular pool cover from GLI (click here to check the price on Amazon) is made out of 2-ply mesh that is finely woven so it keeps out debris while allowing rain to seep through. 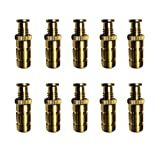 It also keeps out UV rays to resist evaporation and chlorine disintegration, and comes with solid brass anchors and stainless steel springs that won’t erode in harsh elements. It's made with a material that is rot and mildew resistant and will also stand up to years of contact with pool chemicals, and will hold up to 4,000 lbs. and comes with a 12 year warranty. For this cover to meet safety standards, it must be perfectly rectangle with square corners. There also has to be at least 3 feet of concrete surrounding the pool. This solar cover by Sun2Solar (click here to check the price on Amazon) is attractively designed in blue and it helps minimize up to 95% of evaporation in your pool. It's lightweight and easy to handle alone, and is constructed from heavy duty resin with thousands of tiny air pockets that absorb the heat from the sun and transfer it into your pool. It's also highly customizable: you simply trim it with scissors to fit the exact size of your pool. It even comes with a 6 ½ year warranty that is not affected by trimming it. This durable 12-mil solar cover from Blue Wave (click here to check the price on Amazon) has thousands of air bubbles to retain heat from the sun and heat your pool. It's a transparent blue color that is not an eyesore in your pool, and when used properly, it will keep the pool about 15º warmer. It's UV-protected so that it won’t be damaged by the sun and comes with a 5-year warranty. It’s also super lightweight and easy to install, remove and store by yourself. I like this one because it comes with so many different sizes, you will be able to find one that fits perfectly without having to trim it. This Blue Wave cover (click here to check the price on Amazon) is made with a durable woven black mesh polyethylene, and eliminates the need to manually skim leaves off the pool every day and makes clean-up a snap. This one is tightly-woven so that not much can get through it. It’s designed with an extra 3-4 foot overlap so that your whole pool is covered and come with a winch and cable to hold it in place. These are made to be used over your winter cover but can also be used alone just to keep out debris. It's also covered by a 4-year warranty. 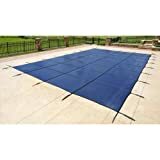 The Blue Wave Bronze pool cover (click here to check the price on Amazon) is designed ruggedly with polyethylene scrim and coating to withstand even the harshest weather. It's UV-protected so that they don’t deteriorate in the sun, and it comes with loops and grommets for secure installation, made with a 5-foot overlap for extra coverage. It’s attractively designed in dark navy with a black underside to restrict algae growth, and it’s also covered by an 8-year warranty. This Pool Mate cover (click here to check the price on Amazon) is made to protect your pool during even the harshest weather conditions. It's made with durable polyethylene that blocks UV rays, keeping the chlorine as active as possible. It also keeps all dirt and debris out, making clean-up after removal a breeze. It's designed with a 5-foot overlap for maximum coverage and should be secured with water tubes that you can purchase separately. It's also lightweight so that it’s easy to install and remove, and it’s covered by a 10-year warranty. If you've ever gone a swim season without one, you probably know the value of a good pool cover. When used correctly, they can save you hours of work and hundreds on energy bills and pool chemicals. Decide what needs matter most to you and choose the pool cover that fits your needs and budget. You'll probably never go a day without one again!